blog | Oh Happy Dae! There’s something about this time of year that makes me wanna go to comic conventions! It’s probably because San Diego Comic Con happens during the summer, but Seoul also recently had its first Comic Con this month as well! Unfortunately I wasn’t able to go because I was on vacation. Being in it’s infancy still I wasn’t surprised to see the featured guest list was rather small, as was the panel guest list but nearly as much as the former. The artist list seemed much more solid. That is not a surprise. Korea likes it’s comics especially in the way of web comics like those featured on Naver Webtoon. Also Seoul and Busan Comic World, which happen regularly throughout the year, pretty much only have a giant artist alley as well as cosplayers. That all being said, I’ve recently thought about how I wish I could get to a comic convention. I was lucky enough to go to SDCC years ago (like, about 8 or so years ago?) before it was so dang hard to get tickets. It was amazing for little ol’ geeky me. A giant gathering of all kinds of people who love all kinds of media. If you can get past the crowds and waiting in lines (c’mon, guys, that’s inevitable) an event like that was just so fun! But it’s getting harder and harder to attend SDCC. Plus, it’s rather far. Putting aside that I’m currently in another country, even going from Wisconsin was an investment in time and plenty of money. The flight cost I can swallow, but a hotel in downtown San Diego during SDCC is nothing to sneeze at. If only there was such a gathering closer to home! Milwaukee may be a little bit of reach now for a comic convention on a grand scale, but Chicago is much more doable. There are actually a few decent conventions in Chicago like Wizard World and C2E2. And my dream con experience? There’s no denying my weeaboo/anime past. Though I don’t watch nearly as much anime anymore there’s a couple shows that have a special place in my heart. One of them is Sailor Moon. A team of badass girls who saved the world? Heck yes! I probably first picked Mars because I’m an Aries, but I loved her no-nonsense attitude and that she was a strong independent girl (well, more so in the manga than the anime). The costume is somewhat straightforward too – no crazy hairstyle, no weapons, pretty plain footwear. Sakura is another favorite of mine. It’s one of the shows I bonded over with my friend (hence why we do the podcast). If there’s one thing CLAMP does well it’s costume design. Sakura has some gorgeous costumes thanks to Tomoyo. Her dress from the 3rd season opening “Platinum” is sooo cute! Lots of ribbons and frills — which means gathering the fabric on that skirt would probably be a pain lol. The wings seem like they’d take a bit of work too. I’m a novice seamstress at best so this would pose quite a challenge, but this is a dream cosplay so I’ll just keep dreaming. CLAMP – the group of women behind some of the best-known manga/anime like “Cardcaptor Sakura”, “Chobits”, and “Magic Knight Rayearth”. I don’t even know if they’ve ever made an appearance at a con in North America. Barring them, since we’re getting a new Cardcaptor Sakura series I’d like to see people involved with the show like directors, artists, and voice actors. Webtoon artists – I really enjoy the comics I find on the Webtoon app. I’d love to see a panel of some of my favorite aritsts likes: Nichola Gwon (who you might also know from her YouTube channel My Korean Husband), Shen [Bluechair/Live With Yourself], Dami Lee [As Per Usual], Bonnie Pang [Roar Street Journal], and Penguin [Penguin Loves Mev]. The Adventure Zone – I don’t even play D&D, but I recently fell in love with this podcast by the McElroy family. I started listening to “My Brother My Brother And Me”, or MBMBAM, earlier this year, but only started “Adventure Zone” a month or so ago. I can’t stop listening to these good, good boys! The brothers, along with their father, are just too dang funny. I find myself grinning like an idiot in public because I’m trying hard not to laugh out loud (I can’t always stop myself). I think a live show of “Adventure Zone” would be very fun at a con. You can find their podcast at Maximum Fun or any fine podcast app. PIXAR arists – I’m a pretty big fan of PIXAR films. I used to listen to the “WALL-E” soundtrack on repeat during my last couple years of undergraduate school (very nice to paint to btw). You can usually see some kind of material from PIXAR/Disney at big cons like SDCC or, obviously, D23. I’d be interested to see a panel of folks like directors, storyboard artists, foley artists, etc. There’s so much that happens over the course of making just one film that you could probably hold a couple different panels with different departments. There’s probably a far amount of animation fans that would be keen to see that. Whew! I didn’t even delve too deeply and that really required some thought! I can’t imagine what all goes in to planning an entire convention. If you’re looking to plan your own event, though, you should check out Eventbrite. They have Online Event Registration that helps make planning easier. You can set up free or ticketed events, manage data, it’s mobile-optimized, and it has built-in event promotion and social sharing tools. You can, of course, use the main site to look for local events to attend in your area as well. Hopefully I’ll get together my photos and videos from my recent trip to Taiwan. My MacBook just decided it hated it’s hard drive, so that’s in the shop. I’m lucky I have a back-up! Summer vacation is over after this week too, so I hope I can stay focused! Posted in giveaway	by Oh Happy Dae! I just can’t resists cute things. So heaven help me if I walk past Artbox. 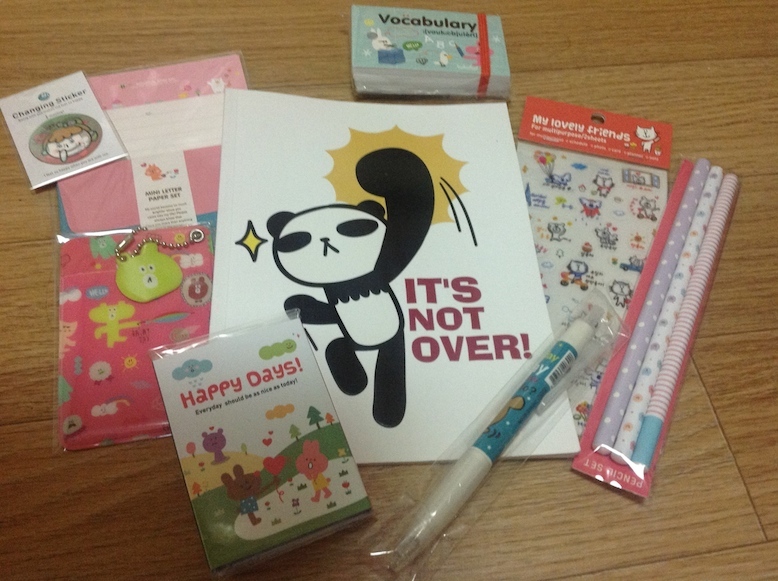 Artbox is one of my favorite stores. They have stationary, clothing, make-up, home goods, and more! 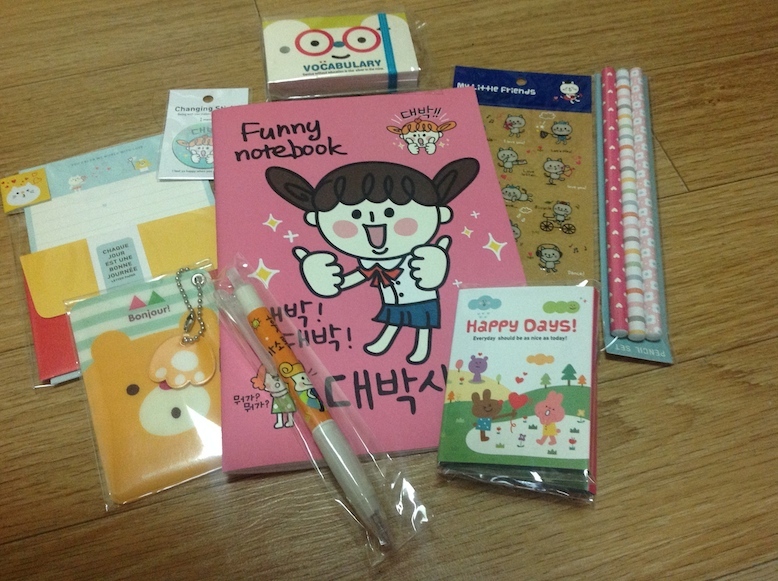 I especially like buying the notebooks for when I’m studying Korean. So I’m going to share my love of this fine store with you guys. I will be giving away 2 sets of goodies to 2 lucky people. Check ’em out! This is the perfect little set for studying languages, I think. I love the vocabulary note cards. Much better than the big ones I used to use when I was in school.